Face Oils are something that I got into a few years ago and I've never looked back since. Here are four that I currently have on rotation, with an explanation of why I use them and when. If you're new to face oils or on a budget and only want to buy one, it's difficult to go wrong with a bottle of pure Jojoba Oil. This simple, all-natural oil can be used in lots of different ways; as a cleanser, body moisturiser, carrier oil, face moisturiser, hair conditioner, makeup remover and as a shaving oil, to name just a few! It's a great all-rounder that's packed full of fatty acids, to rehydrate dry skin and give it a healthy looking glow. This one from Oro de Sonora is a family-run business based in the Sonoran Desert in Arizona, USA, where they grow their own Jojoba trees, harvest the seeds, press the oil, and bottle it all themselves to certified organic standards. I like using Jojoba as a face oil when my complexion feels tight or dry as it helps to rebalance and moisturise my skin without clogging my pores. 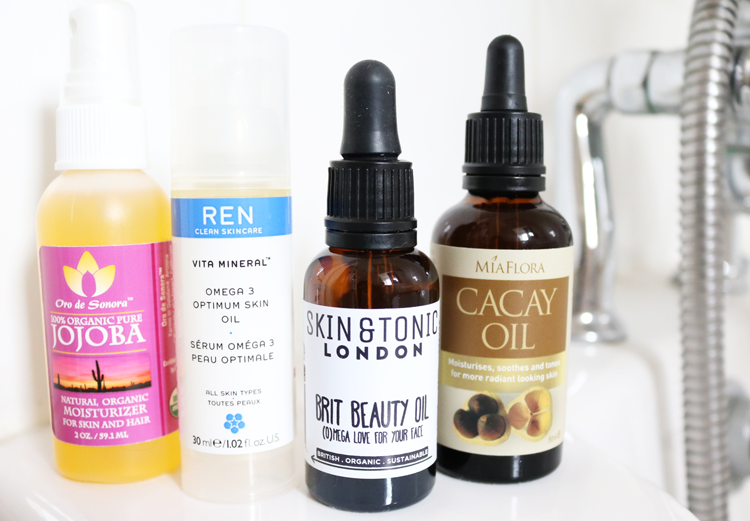 Best for Anti-Aging: REN Vita Mineral Omega 3 Optimum Skin Serum Oil* (30ml, £25, link) - on offer this week until 18th Sept - use code VITA to get 20% off the REN Vita Mineral range, and code SUPERHERO for a free Superhero Kit for all REN orders over £40. For those wanting to reduce the signs of premature aging, REN's popular Omega 3 Optimum Skin Serum Oil has key ingredients such as Wheat Germ Oil, which is rich in Vitamin E and protects against UV damage; Vegetable Plankton, high in Omega 3 to boost skin renewal; and Rosehip Seed Oil, rich in Vitamin A to hydrate and stimulate cell turnaround. It's light, easily absorbed, and I saw a noticeable difference to my skin after just a week of using it every night, so I've been using it a regular basis. It was more plumped up, didn't feel dry or tight, and felt a lot less irritated overall. I think this will be even more beneficial with long term use for anti-aging benefits alone. Brit Beauty Oil from Skin & Tonic is quite simply a powerhouse formula of just six effective natural ingredients. This organic blend of Thistle Oil, Chia Seed Oil, Borage Oil, Marshmallow Root Oil, Sunflower Oil, and Neroli, is loaded with omegas 3 & 6 and packed full of antioxidants which help to repair damaged skin, calm inflammation, nourish, hydrate and encourage healthy cell renewal. I'll reach for this when my skin is stressed out from a busy week and needs that extra TLC - a few drops really works wonders! Cacay Oil is one of the newer all-natural oils on the market and has been getting a lot of hype from the green beauty community because it contains more Vitamin E than Argan Oil and more Vitamin A than Rosehip Oil. This means it's an excellent choice for anyone who has sensitive skin and wants a face oil that's going to deeply nourish, moisturise and reduce the appearance of fine lines and wrinkles. You can also use a few drops on your hair as a leave-in conditioner instead of Argan Oil. I like to switch to Cacay Oil when my skin is feeling a bit temperamental and sensitive as I know it won't break me out.